Revisiting the extension of the Brussels urban agglomeration : new methods, new data … new results ? L’extension de l’agglomération bruxelloise revisitée : nouvelles méthodes, nouvelles données… nouveaux résultats ? Two recent techniques are here used to delineate the urban agglomeration of Brussels : a fractal methodology for extracting the border between urban and not-urban surfaces, and a network analysis based on modularity applied on two different interaction matrices (telephone fluxes, commuting). In order to define spatial subsets in which relationships between places are more intense. These methods have the advantage of not depending upon a priori defined thresholds : thresholds are fixed by the methods and data themselves (endogenous). These methods have been applied on the entire territory of Belgium (Blondel, Krings and Thomas, 2010 ; Tannier and Thomas, 2012) and are here discussed for Brussels only. Results are further compared to more traditional delineations. Observed differences are mainly observed at the outskirts of the agglomeration but are very important in terms of policy : the urban-rural limit depends upon the criterion (definition, threshold) and method used. The two methods used here have the advantage of not depending upon arbitrary choices. Deux techniques récentes sont utilisées ici pour délimiter l’aire urbaine bruxelloise : d’une part une méthode fractale pour extraire la bordure entre tissus urbain et non-urbain, d’autre part une technique d’analyse de réseaux basée sur la modularité est appliquée à deux matrices d’interactions spatiales différentes (flux téléphoniques et navettes) afin de définir des ensembles dans lesquels les relations entre lieux sont plus intenses. Ces méthodes présentent l’avantage de ne pas dépendre de seuils de valeurs définis a priori. Les seuils de valeurs sont ici fixés par les méthodes et les données elles-mêmes (endogènes). Ces méthodes ont été appliquées à la Belgique entière (Blondel, Krings et Thomas, 2010 ; Tannier et Thomas, 2012) et sont ici discutées pour Bruxelles uniquement. Les résultats sont comparés avec des découpages plus traditionnels. Conformément à l’attente, les différences se marquent ici essentiellement à la marge du milieu d’études, mais sont à considérer en cas de décision politique : la limite urbain-rural dépend du critère (définition et seuils) et de la méthode utilisés ! Les deux méthodes utilisées ici ont l’avantage de se libérer de choix arbitraires. Authors would like to thank – in alphabetical order - Vincent Blondel, Gauthier Krings, Cécile Tannier and Gilles Vuidel for their methodological collaboration in studying Belgium. The comparison proposed in this paper was partly undertaken in the context of the SustainCity EU FP7 research project. 1Defining the spatial extent of urban agglomerations, urban metropolitan areas or that of local labour markets has fascinated geographers and other spatial analysts since decades, and has led to an impressive amount of (mainly empirical) literature. Functional as well as morphological criteria are commonly used separately or simultaneously (see e.g. Cheshire and Gornostaeve, 2002 ; Parr, 2007 ; Readfearn, 2007 ; Bode, 2008 ; Cörvers et al., 2009). Unfortunately and at some exceptions, methods and criteria often vary from one case study to another, and so do also thresholds and parameters values, rending comparisons in time and/or space quite hazardous (see e.g. Dujardin et al., 2007 ; Farmer and Fotheringham, 2011). All these values are unfortunately often quite arbitrary or very little justified, while it is well known that they largely influence the number and size of the spatial partitions. Hence, results of such spatial partitioning always have to be interpreted quite carefully, in relation to data, variables, methods and thresholds selections, as well as to the history of the urbanization. Given the complexity of the urbanisation process, definition and delineation of urban territories may also differ with respect to the goal pursued (transport management, urbanism specifications, tax receipt, etc.) making the problem even trickier. 2This is also and particularly the case of Brussels (see e.g. Cheshire, 2010 ; Dembour, 2004 ; Dujardin et al., 2007 ; Vandermotten, 2005). The capital city of Belgium is located in the middle of the country and its limits officially correspond to the administrative boundary of the Brussels Capital Region (BCR). However, it is well known that the city (bilingual) sprawls out of its administrative limits into two different linguistic and political regions (Flanders and Wallonia) making the case study quite interesting scientifically and tricky politically! Brussels is a job centre characterized by the location of many international institutions and hence quite attractive (e.g. Riguelle et al., 2007 or Thisse and Thomas, 2010). Given the small size of the country and its high built-up density, the sprawl of Brussels is geographically limited by the proximity of other urban centres (Mechelen, Aalst, Leuven, …) and physically by the existence of a large forest in the south of the city (Forêt de Soignes) (see e.g. Van Hecke et al., 2007). 3Several attempts have already been made to define the limits of “urban territories” around Brussels (see e.g. Van Hecke et al., 2007 ; Vandermotten, 2008 ; Dujardin et al., 2007). Each of them ends up with a set of communes much larger than the 19 communes of the BCR, but the exact number and composition vary with the method and criteria used, and none can be said as “better” than the other. Most of these attempts are based on one or several thresholds values often little or not justified (see e.g. 650 inhabitants per square kilometre, 10 or 15 % of the commuters to Brussels, etc. – see Luyten and Van Hecke, 2007 p. 28) and some selected variables may lead to endogeneity problems (let us cite the example of the increase in average income which can be discussed in terms of measure of urbanisation in a small country like Belgium). Last but not least, the basic spatial units for defining the urban territories also differ (statistical sectors, communes). Consequently, results do not perfectly converge spatially and several nomenclatures are used (urban agglomeration, urban region, metropolitan area, etc.). Moreover, it is often necessary to regularly update not only the indicators but also the thresholds values used. 4Hence, we propose some results obtained more “automatically”, with totally different methods and data. They were all applied for the entire country and we here specifically zoom on the results for Brussels. Two recent methodologies are used for defining metropolitan territories ; both are characterized by the fact that the number, size and border of the so defined urban areas are given by the methods themselves (endogenously). A morphological definition of the urban agglomeration of Brussels is first obtained by means of techniques based on fractal analysis and applied to the built-up footprints. In this case the built-up surfaces are the only data used ; results are reported in Section 2. In Section 3, a functional delineation is obtained by means of a methodology based on modularity and applied to two different interaction matrices (commuters and telephone calls). Results are then compared (Section 4). Hence the partitions of space proposed in this paper do not depend upon threshold values exogenously fixed by the researcher, but are determined by the method itself. Practically, this paper aims at putting together some recently obtained results about spatial delineations of urban territories in general, and on Brussels in particular, and at comparing them with delineations commonly adopted in the Belgian geography community. 5Morphological urban agglomerations are often defined in Belgium on population density thresholds. Let us here cite the example of Vandermotten (2005, 2008) who uses 650 hab/km² or that of Dujardin et al. (2007) who use 700 with little or no justification. Other attempts use inter-building distances (such as 200 meters - Van Hecke et al., 2007). Slight changes in these thresholds values will automatically lead to differences in the border design, which hence can lead to drastic delineation differences with expectable policy consequences (see e.g. Dujardin et al., 2007). These changes are often little documented and the relevance of a predefined distance threshold is questionable especially when the spacing of buildings varies considerably (Chaudhry and Mackaness, 2008). 6The method used here does not require any a priori definition of thresholds for defining the morphological agglomeration. It has been developed by Tannier et al. (2011) and applied to the 18 largest Belgian agglomerations (see Tannier and Thomas, submitted). Very simple data material is needed for extracting this urban-rural border : a vector map representing the two dimensional footprint of the buildings is used as starting point (here : 2009 Land Registry data called Cadastre/Kadaster). All built-up surfaces are in represented in black, while not built-up surfaces are in white ; these latter correspond to any other land-uses than buildings (streets, green areas, fields, undeveloped sites, parking lots, etc.). Shortly said, the method works as follows : first, each building of the building map is dilated. Then the number of built clusters is counted after each dilation step and the results plotted, with the X-axis representing the width of the dilation buffer and the Y-axis being the corresponding number of built clusters. In a third step, a distance threshold is identified on the dilation curve ; it corresponds to the point of main curvature (Lowe, 1989) and divides the data in two morphological subsets in terms of fractals. This point shows the existence of a discontinuity across scales. In a fourth and last step, the urban boundary is mapped. We then apply to the building map a buffer with a diameter equal to the distance threshold. This method has the advantage of not depending of any externally defined threshold and can be automatically and easily be applied using Morpholim (http://www.spatial-modelling.info/​MorphoLim-Identifying-city). 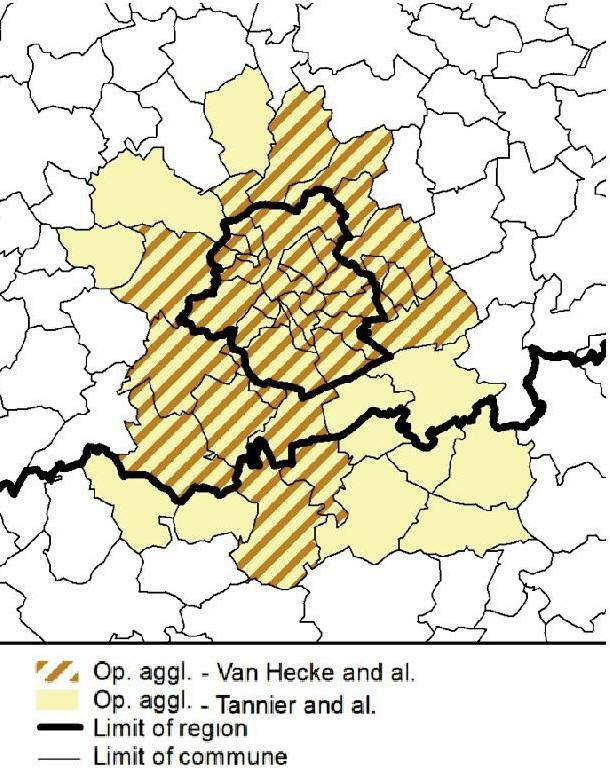 7In Tannier and Thomas (submitted), the Belgian urban agglomerations are compared together in terms of extension and shape of borders, but they are also compared to theoretically generated cities and their suburbs. Here, we simply zoom on Brussels, and compare the obtained limits to commonly adopted delineations (Figure 1). Figure 1 shows a relative compactness of the morphological agglomeration sensu stricto and an elongation along well-defined transportation axes. The operational morphological agglomeration corresponds to the set of communes encompassing the so defined morphological agglomeration. Figure 2 compares the operational morphological agglomeration obtained by Van Hecke et al. (2007) to that proposed in Figure 1 ; let us remind that Van Hecke et al. use distance between buildings as main criterion. Tannier et al.. obtain 48 communes while Van Hecke et al.. end up with 36 communes. The observed difference may be explained by methodological differences as well as by the differences in data bases : Van Hecke et al. use orthophotoplans (1998-2000) and data expressed at the level of statistical sectors, while Tannier et al. use the 2009 digitized Land Registry data base at the scale of the building. Land Registry data are very convenient, available at fine scale (building), are easily prepared for the software and regularly updated. Observed differences mainly concern the southeastern periurbanisation axis up to Wavre and Ottignies-Louvain-la-Neuve through Overijse, Lasne, La Hulpe and Rixensart, and also border communes (with no big surprise) like Braine-le-Château, Tubize, Ternat, Asse and Meise. Figure 1. Morphological agglomeration of Brussels and the corresponding “operational agglomeration”. Source : Tannier et Thomas (submitted). Figure 2. Operational morphological agglomeration defined by Tannier and Thomas (submitted) compared to that of Van Hecke et al. (2007). 8Farmer and Fotheringham (2011) state that there are three general classes of procedures defined in the geographical literature for designing functional agglomerations : (1) hierarchical clustering, (2) multistage aggregation, and (3) central place aggregation. The usefulness of these procedures has already widely been demonstrated. Here, commuting patterns/phones calls are considered as a network of edges and nodes, where each node is a place (e.g. communes) and each edge a flux (e.g. commuters). If this is not a novel approach in regional sciences (see e.g. Karlsson and Olsson, 2006 for a review), it is nowadays renewed with the recent interest of engineers and physicists for methods specifically designed for finding groups in huge (network) databases (see e.g. Girvan and Newman, 2002 ; Newman, 2006 or Farmer and Fotheringham, 2011). These methods are often designed for measuring the degree to which a network displays “communities”, for dividing network vertices into subsets, where within-group connections are dense and between group connections sparse (Newman and Grivan, 2004 or Farmer and Fotheringham, 2011). Within this theoretical framework, Blondel et al. (2008) and Aynaud et al. (2010) developed an original mathematical method for detecting naturally and automatically coherent groups within very large interaction matrices : the “Méthode de Louvain” which has widely been recognized in the scientific literature (see e.g. Lancichinetti and Furnato, 2009). It uses a greedy algorithm for clustering nodes hierarchically ; groups are formed by maximizing modularity : it takes into consideration the extent to which there are dense connections within clusters, but only sparse connections between clusters ; a robustness test is also performed. This method has several advantages for the spatial analysis of networks such as : (1) the optimal number of clusters and their delineation are provided by the method itself (endogenously) ; they are not influenced by the user (no thresholds value is needed) ; (2) the grouping of nodes is done with no measurement of centrality or accessibility : only the intensity of the interaction is considered ; there is no predefined central node ; (3) this method is now available in several softwares, such as the igraph library (http://igraph.sourceforge.net/​), NetworkX software (http://networkx.lanl.gov/​) or Tulip software (http://tulip.labri.fr/​TulipDrupal/​). In the applications reported here, nodes are simply municipalities, and interactions are or the frequency of calls (first application hereunder), or the number of commuters (second one). The effectiveness of this type of method has recently been demonstrated and recognized for spatial analysis of flux matrices in geography (see e.g. Farmer and Fotheringham, 2011). 9Let us first consider mobile telephone communications of all of the customers of one major Belgian provider (see Blondel et al., 2010). The database contains more than 200 million communications over a period of six months (2006-2007), for private or personal use (no difference). We limit ourselves to the frequency of calls and not their length (see Blondel et al. 2010 for further development). Each customer is geocoded according to the billing address, which is summarized for confidentiality reasons by municipality code. (Let us here insist : we did not consider the location of customers at the time of the call.) We therefore obtain an interaction matrix with all the communications made by the customers located in a municipality A to the customers located in municipality B. Figure 3. Telephone basin of Brussels. Source : Blondel et al., 2010. 10The Méthode de Louvain was applied for the entire Belgian territory (589 municipalities), and 17 groups of municipalities were obtained (see Blondel, Krings and Thomas, 2010 for further details). Quite interestingly, these groups were all made out of adjacent municipalities. The largest basin contains 66 municipalities and is - not surprisingly - centred on Brussels (Figure 3). It is obvious that in terms of mobile phone calls, Brussels extends beyond its administrative borders, and the telephone basin of Brussels not only covers the 19 municipalities of the Brussels-Capital Region, but also the 47 directly adjacent municipalities regardless the geographical direction. In the South of Brussels, the basin encompasses the entire Province of Brabant Wallon at the exception of the city of Nivelles and two municipalities to the far East (Hélécine and Orp-Jauche). This extension of Brussels towards the south is clearly to be associated with the history of the suburbanisation of Brussels, coupled with a linguistic and socioeconomic reality. 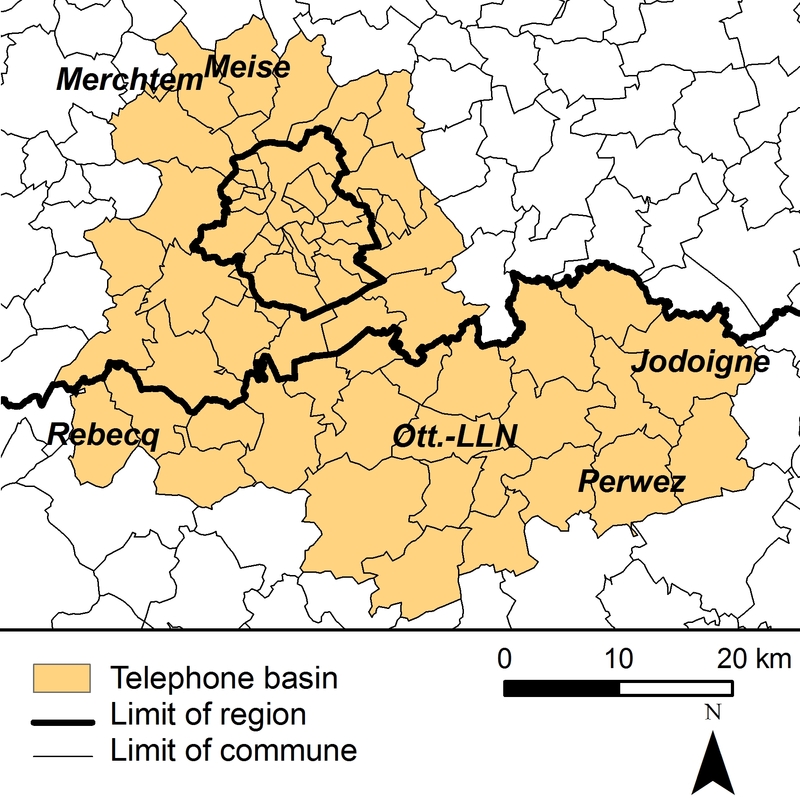 The Brussels mobile telephone area encompasses municipalities such as Halle, Vilvoorde, Zaventem, Tervuren, Braine-l’Alleud, Ottignies-Louvain-la-Neuve, Wavre, Perwez and Jodoigne. Interestingly, Leuven is not included, and is associated to Mechelen in another phone basin. The Brussels telephone area resembles (but is not equal!) its urban area : it covers a much larger area than the 19 municipalities of the Brussels-Capital Region, all around the capital with however a stronger spatial extension towards the south. 11Let us now apply exactly the same method, but this time for the 2007 flows of commuters (estimation) in Belgium (Source : Service Public federal, Mobilité et Transports, http://www.mobilit.fgov.be/​fr/​index.htm) in order this time to obtain “job basins” and zoom to the results obtained for Brussels. Let us here insist that the method gives the optimal number of clusters as well as their delineation, without any external intervention (no fixed value threshold, etc.) and without any contiguity constraint. A job basin is of course larger than a so-called “urban agglomeration” ; it corresponds to the economic hinterland of the city in terms of commuting. We can expect that it is spatially different from phone basins, which are social interactions areas. 12Applying the method to the Belgian territory (589x589 matrix) has led to the partition of the country into 9 job basins, that is to say a much smaller number than phone basins. The largest basin is once again Brussels with this time 105 communes (see Figure 4) ; this confirms the importance of Brussels in the country (see e.g. Thisse and Thomas, 2010). As expected, the job basin of Brussels encompasses the communes around the Brussels Capital Region, all the communes of Brabant Wallon up to Gembloux (Province of Namur) and especially extends westwards to Ninove and Aalst. This latter extension was perfectly expectable by the long commuting tradition in this part of the country (Valley of the Dendre, Pajottenland) (see Verhetsel et al., 2009). Note that once again, in the East, Leuven is not included in the job basin of Brussels : it is a job basin on its own. 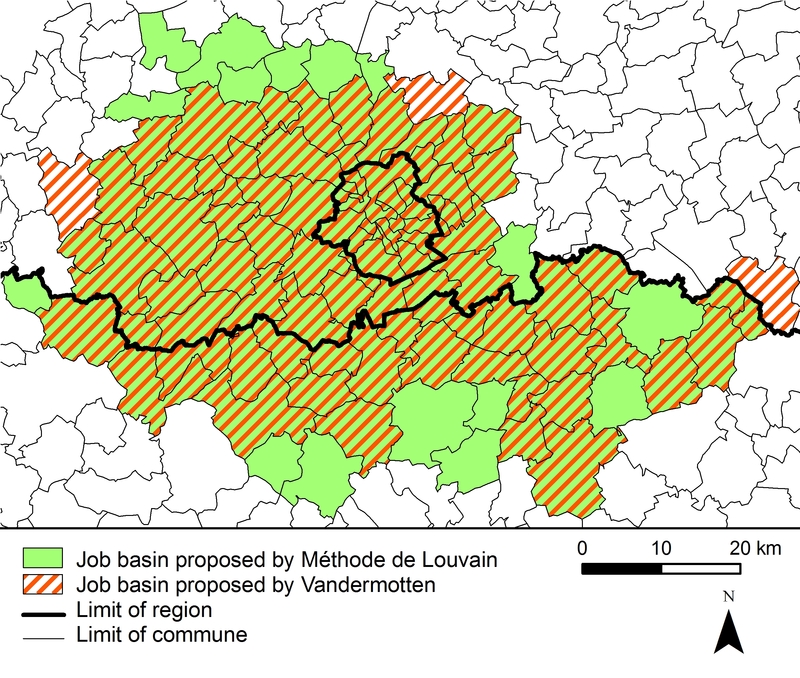 13Figure 5 compares the here obtained job basin to that proposed by Vandermotten (2008). Once again borders are not exactly the same : differences are obtained for municipalities lying at the outskirts. This is due to differences in methodologies : on the one hand, the method of Blondel et al. (2008 and 2010) optimizes the clustering based on interactions between all Belgian municipalities, while on the other hand, Vandermotten used a threshold (10 %) on the commuter flows to Brussels only. Both are coherent and justified but they are different. One result is not “better” than the other, but using it implies controlling the method. Let us insist : the Méthode de Louvain has the advantage of (1) considering the interactions between all Belgian municipalities but also that (2) no a priori threshold is imposed ; the method optimizes the partitioning. Figure 4. Job basin of Brussels obtained by applying the “Méthode de Louvain” on 2007 commuters flows. Figure 5. Job basin proposed by Blondel et al. (2010) compared to that proposed by Vandermotten (2008). 14Figure 6 superposes the three new delineations proposed in this paper (morphological delineation of Figure 1, phone basins of Figure 3 and job basins of Figure 4) into one single document : communes coloured in dark blue are those that always belong to one of the defined urban territories ; whatever the method, whatever the criterion, they always appear to be central and very different from their outskirts. The lightest blue corresponds to communes belonging to the “urban territory” for one type of partition only. The map confirms what has been said earlier : a strong centre-periphery structure, with the western part mainly characterized by a commuter dependency to Brussels (economic) while the city spatially extends to the southern part in terms of the 3 criteria (morphology, social and economic). Figure 6. Comparison of the fractal morphological agglomeration, job and phone basins. 15Figure 6 reminds how delicate it is to define a metropolitan area in a univocal way. No method is “better” than another, but it is always primordial to first know the final objective of any proposed spatial partitioning, as well as the selected criteria before discussing the map and its political potentialities. Exact borders are difficult to draw ; they are by definition fuzzy. Let us insist and remind that we here do not depend upon any empirical threshold as the methods themselves optimize the design of the clusters on the given data, and that all three partitioning were done for the entire country even if we only give the results for Brussels (relationships with the rest of the country are considered). The three proposed delineations are hence methodologically strong. 16The “urban territory” of Brussels has a quite reasonable shape (Figure 6), a little larger than those proposed more traditionally (see Figures 2 and 5). Clearly, Brussels extends more to the south in terms of social interactions (approximated by phone calls relationships), while the economic partition extends more westwards (in terms of commuting to work) : this difference is easily explained by commuting tradition, by periurbanisation history and also by the fact that in the south, larger “competing” cities are located further away from Brussels. From Figures 4 to 6, we see that Leuven corresponds for sure to a separated urban story, not belonging to Brussels hinterland. Tables 1 to 3 give the relative distribution of the communes for the three partitions and the three Regions. Interestingly enough, they confirm the map, but the interpretation may slightly differ when weighting by population (Table 2) or by surface covered (Table 3). 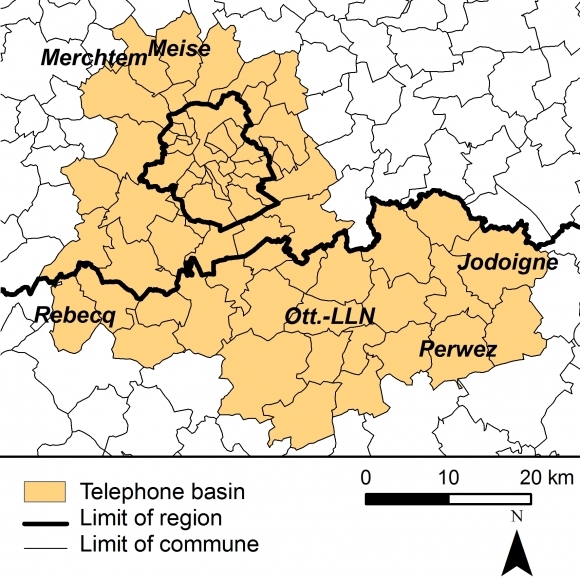 Proportionally, job and telephone basins extend more in Wallonia in terms of surface than they do in terms of inhabitants or number of communes. Once again, any interpretation has always to be done quite carefully, and this is even truer if one uses these partitions for any policy or political purpose! 17The new techniques used in this paper enable one to propose robust and optimal results, with no subjective thresholds or variables choices, and with very short computing time. Results are not ground breaking compared to what has already been written about Brussels (or other cities) with more traditional indices or methods, but they show how the urban fringe may be interpreted quite differently. The rural/urban border is fuzzy, far from being clear-cut. These methods are well-suited for updating and measuring spatio-temporal changes. Table 1. Comparison of the three here defined urban territories around Brussels in terms of number of communes (in absolute and relative terms). Table 2. Comparison of the 3 here defined urban territories around Brussels in terms of number of inhabitants (in relative terms). Table 3. Comparison of the 3 here defined urban territories around Brussels in terms of surface of the communes (in relative terms). Aynaud T., Blondel V., Guillaume J.-L., Lambiotte R. (2010), “Optimisation locale multi-niveaux de la modularité”, Partitionnement de graphe : optimisation et applications, Traité IC2, Hermes-Lavoisier. Blondel V., Guillaume J.-L., Lambiotte R., Lefebvre E. (2008), “Fast Unfolding of Communities in Large Networks”, Journal of Statistical Mechanics : Theory and Experiment, P10008, 12 p.
Blondel V., Krings G., Thomas I. (2010), “Régions et frontières de téléphonie mobile en Belgique et dans l’aire métropolitaine bruxelloise”, Brussels Studies, 42, 12 p.
Burchfield M., Overman H.G., Puga D., Turner M. (2006), “Causes of sprawl : a portrait from space”, Quarterly Journal of Economics, pp. 587-633. Chaudhry, O., W. Mackaness W. (2008). “Automatic Identification of Urban Settlement Boundaries for Multiple Representation Databases”, Computers, Environment and Urban Systems, 32, pp. 95-109. Cheshire P., Gornostaeva G. (2002), “Cities and regions : comparable measures require comparable territories”, Les Cahiers de l’Institut d’Amenagement et d’Urbanisme de la Region d’Ile de France, 135 . pp. 13-32. Cörvers F., Hensen M., Bongaerts D. (2009), “Delimitation and Coherence of Functional and Administrative Regions”, Regional Studies, 43, pp. 19-31. Dembour C. (2004), ‘‘Quelles frontières pour l’agglomération bruxelloise’’, Working paper du CEREC (Center for Economic Research, Facultés universitaires Saint-Louis, Bruxelles), n° 2004/6. Dujardin C., Thomas I., Tulkens H. (2007), “Quelles frontières pour Bruxelles ? Une mise à jour”, Reflets et Perspectives de la Vie Economique, XLVI, 2-3, pp. 155-176. Farmer C., Fotheringham S. (2011), “Network-based functional regions”, Environment and Planning A 43, pp. 2723- 2741. Girvan M., Newman M. (2002), “Community structure in social and biological networks”, Proceedings of the National Academy of Sciences of the United States of America, 99, 12, pp. 7821-7826. Karlsson C., Olsson, M. (2006), “The Identification of Functional Regions : Theory, Methods, and Applications”, Annals of Regional Science, 40, 1, pp. 1-18. Lancichinetti A., Fortunato S. (2009), “Community Detection Algorithms : A comparative analysis”, Physical Review E 80, 056117. Luyten S., Van Hecke E. (2007), “De Belgische Stadsgewesten 2001”, Statistics Belgium Working Paper, Brussels. Newman M. (2006), “Modularity and Community Structure in Networks”, Proceedings of the National Academy of Sciences of the USA, 103, 23, pp. 8577-8582. Parr J. (2007), “Spatial Definitions of the City : Four Perspectives”, Urban Studies, 44, 2, pp. 381-392. Readfearn C. (2007) “The topography of metropolitan employment : Identifying centers of employment in a polycentric urban area”, Journal of Urban Economics, 61, pp. 519-541. Riguelle F., Thomas I., Verhetsel A. (2007) “Urban polycentrism : a measurable reality. The case of Brussels”, Journal of Economic Geography, 7, pp. 193-215. Tannier C., Thomas I. (2012), Defining and characterizing urban boundaries : A fractal analysis of theoretical and Belgian cities (submitted for publication). Tannier C., Thomas I., Vuidel G., Frankhauser P. (2011), “Using fractal tools in identifying urban limits without a priori distance thresholds”, Geographical Analysis 43, 2, pp. 211-227. Van Hecke E., Halleux J.-M, Decroly J.-M., Mérenne-Schoumacker B. (2007), “Noyaux d’habitat et régions urbaines dans une Belgique urbanisée”, Monographies Enquête Socio-économique 2001, 9, Brussels, SPF Economie en Politique Scientifique Fédérale. 201 p.
Van der Haegen H. (1991), “Les franges périurbaines en Belgique, quelques éléments de recherche concernant leur délimitation, leur population et leurs caractéristiques sociales”, Espace, Populations, Sociétés, 9, 2, pp. 259-269. Vandermotten C. (2005), Développement économique, développement social et développement durable dans les grandes métropoles européennes. Quelques réflexions au départ de l’exemple bruxellois, Lausanne, Actes du colloque “Développement urbain durable, gestion des ressources et gouvernance”. Vandermotten C. (2008), Bruxelles et son hinterland économique, Bruxelles, 18 juin 2008, Actes du Colloque du Conseil Economique et Social de la Région de Bruxelles-Capitale, p. 62. Verhetsel A., Van Hecke E., Thomas I., Beelen M., Halleux J., Lambotte J., Rixhon G., B. Mérenne-Schoumacker (2009), “Le mouvement pendulaire en Belgique. Les déplacements domicile-lieu de travail. Les déplacements domicile-école”, Monographies Enquête Socio-économique 2001, 10, Brussels, SPF Economie en Politique Scientifique Fédérale. 217 p.